Tested model: Marine Band in C and G customized by Tony Ramos. Playing these harps is a pleasure every harp player should experience one day. Believe me, I'm not kidding. I think I'll always remember the first run I've played on a Ramos in C.
So what's special about these harps? First the shape of the covers is not the standard Marine Band shape. The curvature is bigger, which is very comfortable to play and removes the first draw rattling problem on low key harps. The covers only have 2 screw holes (instead of 4 on standard Marine Band) and the reedplates are screwed to the comb. Then, the wooden comb has been sealed and every edge has been rounded: the comb, the plates, everything. The finition is superb. In terms of playability, these harps are simply incredibly airtight. They respond to the smallest blow. The harp can whisper, cry, shout, ... everything the player wants to express. The sound is brighter than the factory harps one. This is probably due to high embossing of the reed slots. Fine Tuning is perfect (Tony makes it to your taste). This is craftmanship at its best, clearly above everything else I've played, including other custom harps (I haven't really tried Filiskos though). Some may argue that the price is expensive but believe me, it's cheap for both the amount of work and the result. Unfortunately, Tony has stopped taking orders for custom harps as he has taken over HarpOnline. 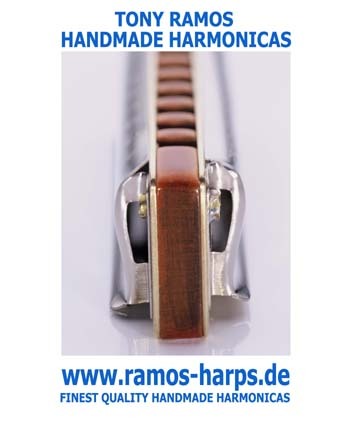 But he will from time to time offer some custom harps in the Harp Online shop. If by chance you're here at the good time, buy one. You'll thank me. Beautiful instrument. Perfect finition. THE bluesharp! Customized instrument at its best. Extremely airtight, responsive and easy to bend. The overblows are clean and can be sustained with vibrato. The harp can still be played hard without choking the 4th, 5th and 6th blow. Rounder covers (better lip grip and no first draw rattling). Probably among the 2 or 3 best harps in the world. The Marine Band being a regular richter harmonica, playing chromatically implies to master the overblows. See the standard richter harps chromatic playing page. In our opinion these harps really make the chromatic playing reachable. The main problems inherent in the overblows are drastically reduced, allowing a good overall sound and a good expressivity. And these harps are so small that one can bring them anywhere!